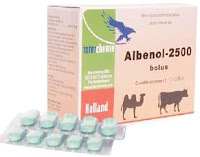 Albendazole is a synthetic anthelmintic which belongs to the group of benzimidazole-derivatives with activity against a broad range of worms and at a higher dosage level also against adult stages of liver fluke. Lung worms : Dictyocaulus viviparus and D. filaria. Liver-fluke : adult Fasciola hepatica. Administration in the first 45 days of gestation. Calves and cattle : 1 bolus per 300 kg. body weight. For liver-fluke : 1 bolus per 250 kg. body weight. - For milk : 4 days. 50 boluses in a carton with blister.